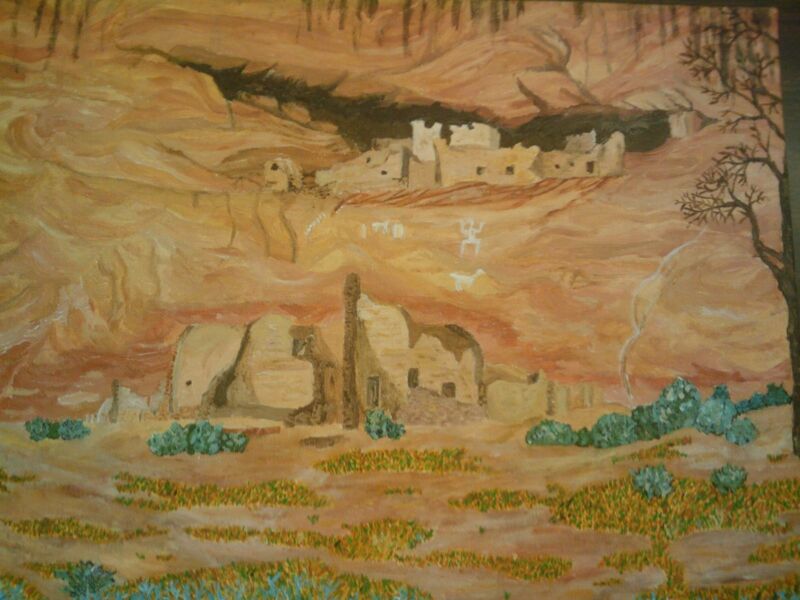 Painting: "The Old House Is Silent"
It's based on a photo I took at Canyon De Chelly (pronounced də·shā′; it's a Spanish corruption of a Navajo word, Tséyi) several years ago, when I was visiting with Krissy. The ruin in question is known as White House Ruin, and dates approximately from 950 AD (when it was a Chacoan Outlier; the westernmost, in fact) to about 1250 when it was finally abandoned for reasons yet unknown, but dramatic droughts and endemic warfare likely played a huge role. Their decedents still live on the Hopi Mesas and in the pueblo villages along the rio grande. 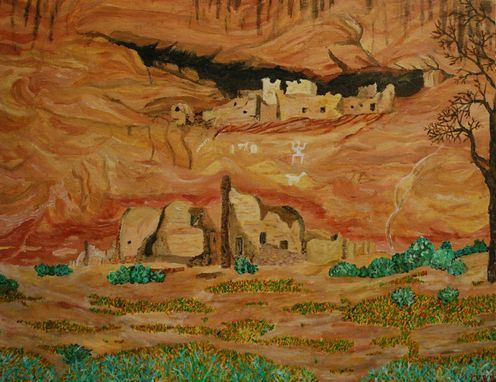 -One of my thought processes for this painting was, what if one of my favorite artists of all time, Vincent Van Gogh, lived in or even visited the southwest? What would his paintings look like? How would he use his techniques and masterful use of color to demonstrate the vivid universe that is at every canyon bend back home? How would he have done a painting of this place? What would he have done to make the place look alive? What shades of color would he mix? And so, I've consciously tried to emulate some of his ideas and given them a few twists with my own personal style. The color has been enhanced, sharpened. Subtle differences from a distance, up close, are dramatic. A minor influence was, of course, my fellow southwesterner; Georgia O'Keefe. -And I've added color in places; the drab, dreary look of winter has shifted to the distant hope of early spring. While life is on the ground, especially in the foreground of the painting, at the back, the ruins are of course, well, in ruins, and the cottonwood has not leafed out yet. It is still winter; a time of sorrow and discontent and death. There is still death and abandonment here, in the background. -At one point, shortly after I started painting the walls of the cliffs, it dawned on me with great humility that I was literally trying to capture with strokes of my paintbrush fossil gusts of desert wind that laid down the massive sand dunes which were turned into stone about 250 million years ago, around the time of The Great Dying. I consciously tried to evoke those fossilized winds, and the vast desert in which these stones were laid down with the curvy, curly brushstrokes you see on the canyon wall. -There was one night where I had a dream I was inside of this painting, and watching the brushstrokes come alive. Actually, that dream influenced how I painted the tumbleweeds, and, looking back, also influenced how I painted the rockface. Quite randomly awesome, actually. -It furthermore occurred to me that some blocks of those fossilized deserts were turned into the walls of a small town of about 250 people, which was then abandoned. The whole place is...perhaps filled with a deep sense of melancholy and mourning for what was lost, and what we will never know about what was lost. -Someone viewing it imagined it as a view of Christ's entry into Hades and the harrowing of Hell. A very interesting interpretation. He felt the petroglyphs looked like the skeletons as described in Ezekiel, and that the ruin inside the alcove in the cliffs was like the gates of Hades. But again, this touches into one of my OTHER artistic influences: Orthodox iconographers, so, overall, not a bad interpretation, and one I hadn't even considered. The fact that my artwork is actually making others think makes me think, and I like that. This piece was done on canvas, 28"x32"